We went on a trial-run camping in Rachel's Grandpa's Rock Star Motor home to the west side of the state. It was our test before we drove to Ocean City, Maryland over the fourth. It gave us a nice idea of what worked on the beach, what did not and what we need to take. 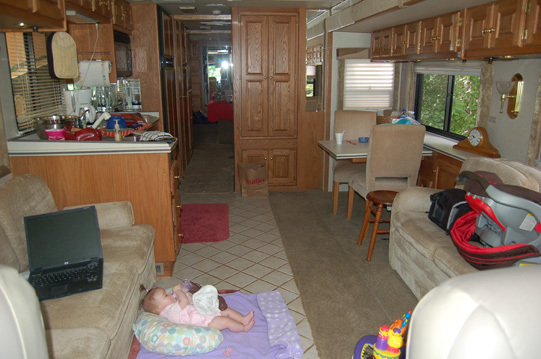 Plus, Grandpa was nice enough to let us borrow his "rock star" motor home, so camping really wasn't all that bad. 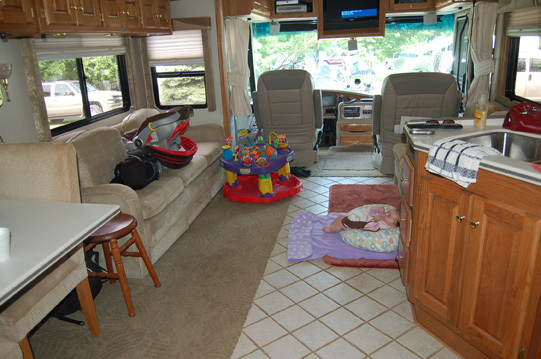 Rachel traveled well in her car seat buckled into the motor home couch, she slept well in her pack n play, enjoyed a bath in the kitchen sink and had a nice long nap in her beach tent on Lake Michigan. She wasn't too fond of the water, mostly because I think it felt cold to her, but she liked the sand and enjoyed "people watching" with her dad. We are so grateful that Grandpa let us borrow his Coach, and watched our dog while we were away. And so thankful to Stacy L. for inviting us on the camping trip. There were about 8-10 families that all camped and hung out at the beach! We hope to do it again next year! 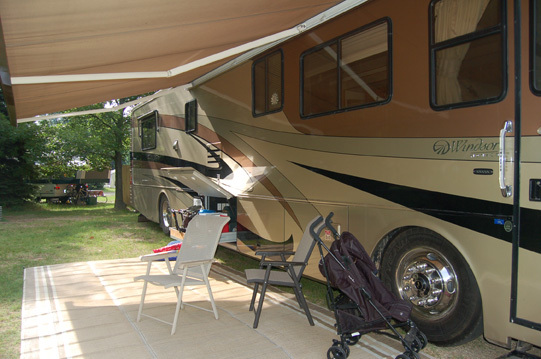 Here is a photo of the coach, all set up and in our camping spot. Rachel comfortably hangs out in the motor home (on the floor). You can see her seat strapped in where she rode for the trip (on the right) and the usual accommodations of camping (laptop/internet on the left couch). Here is the other shot, facing the entrance/driver's seat. The satellite TV wasn't working, which upset my husband who wanted to watch a baseball game. As you can see with the slide out we were able to accommodate her exersaucer for the trip, too! Grandpa even steam cleaned the couch cushions "for Rachel" before we left. I could so do camping with my kids if I had that thing! Wow, is it ever nice! Glad Rachel liked her tent on wheels!